Moving west of Sussex and the London area, the fort at Portchester has been shown to have intense Early Saxon occupation over and cut into late 4th-century Roman layers. Continuity is suggested by the presence of ten unusual convex-sided dishes in black handmade grog-tempered ware with solid hemispherical bosses and diagonal burnished line decoration (one of which is illustrated in Figure 11). Dishes of this type but in three different fabrics occur in three small, well-separated areas within south-central Britain. The grog-tempered version includes not only the Portchester dishes but others from Fareham, Bitterne, Winchester and Silchester in Hampshire, Wootton Creek, Rew Street and Brading on the Isle of Wight and Abinger in Surrey. All of these examples are in black handmade fabric with profuse crushed siltstone grog filler, sometimes accompanied by similarly crushed orange grog, and are described in Table 1. 15998 1 Dark earth 15998 yielded large pottery assemblage, including reconstructable dish with bosses, much of (BB1) cooking-pot of Bestwall type 1/8 with diagonal linear burnish (c. 340-420+) and handmade convex-sided dish with sand and grog filler. From Table 1 it can be seen that all of the stratified examples, with one exception, come from late 4th to early 5th century contexts: the exception is one of the Portchester dishes, which comes from a mid-4th century context in an area heavily disturbed by later pits and postholes. The dishes from the Brooks site in Winchester and Abinger villa in Surrey are clearly 5th century in date, in that the sherds from the former are fresh and of a reconstructable dish found in dark earth over a coin hoard with a clipped siliqua of Gratian: the Abinger example was associated with Early Saxon pottery and was from occupation over ditch fills with more Early Saxon and late Roman sherds. The pottery assemblage associated with the dish from the ditch sectioned at Fareham Crown Offices 3km west of Portchester also suggests 5th-century date in that it includes an abnormally large percentage of sherds from horizontally rilled jars in Overwey/Portchester D fabric, similar to that in the post-388 assemblage from the Tower of London site. The highest percentages of Hampshire grog-tempered wares occur in pottery assemblages from the Isle of Wight (Lyne 1994, 389-91): this and the presence of these embossed dishes on Vectensian sites raises the possibility that the vessel type may have been made there alongside jars and other forms indistinguishable from their late 4th century predecessors. A further concentration of identical dishes but in a local greyware and thought to have originated in the Compton kilns (Miles 1984, fiche 7:D12) occurs on sites in and around Dorchester upon Thames (Figure 12). One of the two stratified dishes from Barton Court Farm and those from the Bishop's Court Rectangle and Wantage are associated with Early Saxon pottery, supporting a 5th-century date for the vessel type (Table 2). The other stratified examples are also clearly of very late 4th-century date at the earliest. 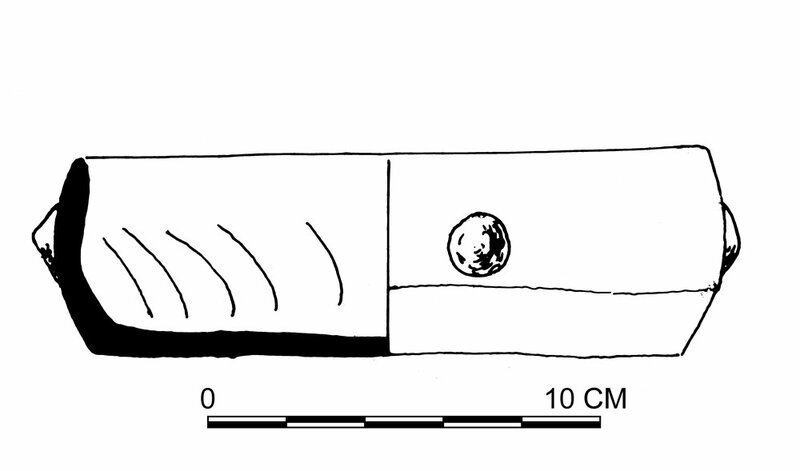 Even more significant is the discovery at Dorchester upon Thames of two copies of these embossed dishes but in an Early Saxon sandy fabric with slashed diagonal linear decoration instead of burnished lines (Figure 13 and Frere 1964, fig. 13-11). This strongly suggests that the use of such dishes overlapped with the production of the earliest insular Saxon pottery there. Dorchester-upon-Thames, like Portchester, is unusual among Roman walled towns and forts in having intensive Early Saxon occupation with grubenhauser, and it has been suggested that Saxons were settled there as foederati by the local sub-Roman administration during the early years of the 5th century. The third centre for production of convex-sided dishes with bosses was in the vicinity of the Roman Alice Holt potteries. The Oxford Archaeological Unit trial-trenched fields to the south of Grooms Farm, Frithend, in 1988 in advance of sand extraction (Moore 1988). This area is just south of Alice Holt Forest with kiln sites to its north, east and south-west. One of the trenches sectioned a massive ditch containing fresh, joining fragments from just a few part-complete vessels: these include a convex-sided dish with pyramidal bosses in a sandy oxidised fabric (Figure 14), an Alice Holt greyware everted-rim jar with white/black firing slip all over its interior as well as on its rim and shoulder and a jar without horizontal rilling in Overwey/Portchester D fabric. This last-mentioned has a tubular neck with a weak beaded rim instead of the usual hooked form. None of these anomalous forms has been encountered elsewhere and it may be that they are some of the last products of the Alice Holt pottery industry; dating from a time when the few remaining potters were engaged in household production for small communities in the immediate vicinity. Moving further west to Gloucestershire, grass-tempered wares are now regarded as dating to the period c. 500-750 instead of c. 450-750 (Jane Timby pers. comm.). Such fabrics are normally confined to small handmade cooking-pots but Frocester has a fragment from a convex-sided dish with solid bosses in this fabric, very similar in form to the examples from Hampshire and Oxfordshire and providing further evidence of a post-Roman date for the form (Timby 2000, fig. 9.11, 239). If the commencement date for grass-tempered wares is correct then it has profound implications regarding the end date for the production of pottery in the Romano-British tradition and suggests that some kind of cultural apartheid may have been practised during the 5th and early 6th centuries in areas with mixtures of British and Saxon communities.